Since Walk-Bike Cupertino’s inception, the city has committed nearly $3.5m in bike/ped safety projects. This is a distinct turnaround from the prior four years of very low resource allocation. Bike/Ped City budget Update – At the June 9 2015 City Council Meeting, the Council approved nearly $800K to fund projects for FY16, ending in June 2016. In June 2016, the City Council approved an additional $2.0M in funds for bike/ped projects in the city. See the list of funded projecst in the Projects Menu. Bike/Ped City budget. Advocated and successfully promoted budget of $685K for the 2014-15 fiscal year. This is the largest budget allocated to Bike/Ped improvements in the prior five years. Planning. Worked closely with Cupertino City staff to identify and prioritize Bike/Ped projects. Newsletters. Walk-Bike Cupertino publishes a regular newsletter available to anyone. Sharrows. Successfully advocated for sharrows (shared lane markings) on McClelland Road from Monta Vista High School to Foothill Blvd. Green bike lanes. 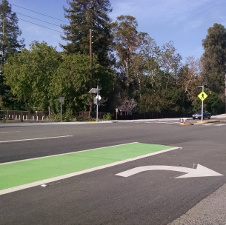 Promoted the need for green bike lanes on Stevens Creek Boulevard from DeAnza to Foothill. Collaboration with local schools, colleges and organizations. Worked with DeAnza College to open up bike entrance on McClelland Road; Worked with Cupertino Rotary to fund a bike repair station at DeAnza College; Currently we are researching and developing a Bike/Ped safety training plan for CUSD (Cupertino Union School District) Middle and elementary students.